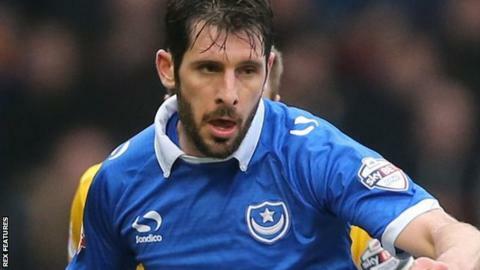 Portsmouth are set to be without Danny Hollands for up to two months after the midfielder fractured a bone in his leg. Hollands, 30, who has made 23 appearances in all competitions this season, has a fractured fibula. "Danny's absolutely devastated," manager Paul Cook told BBC Radio Solent. "He's been one of our stand-out performers in the last month." Portsmouth, fourth in League Two, face Accrington away on Saturday before an FA Cup replay with Ipswich on Tuesday. "We're really disappointed to lose Danny," added Cook. "But his absence hands an opportunity to someone else in the squad to perform." Meanwhile, defender Christian Burgess has resumed training following a month out with an ankle injury. Pompey have also released central midfielder James Dunne by mutual consent. The 26-year-old, who spent two months on loan at Dagenham, has signed for Cambridge United.